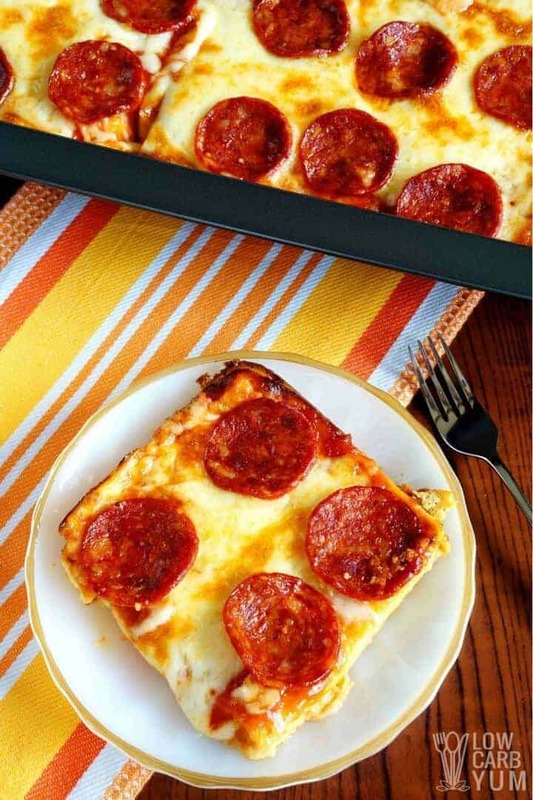 A delicious low carb pizza casserole that will be enjoyed by all. The gluten free crust uses a simple mix of eggs, cheese, and cream so no special ingredients are needed. In the past, I’ve made a few easy keto pizza crusts such as a cauliflower crust, coconut flour pizza crust and a deep dish pan pizza. But I wanted to work on something different this time. Although I set out to make a casserole with pizza flavor, the end result of the recipe turned out to be more of a low carb pizza made in a casserole dish. The crust layer is made with a mix of eggs, cream, and a variety of cheeses along with a little garlic and dried oregano seasonings. The keto pizza needs to be made in a baking dish with sides. The mixture for the gluten free crust is thin and the baking pan needs to contain the liquid. 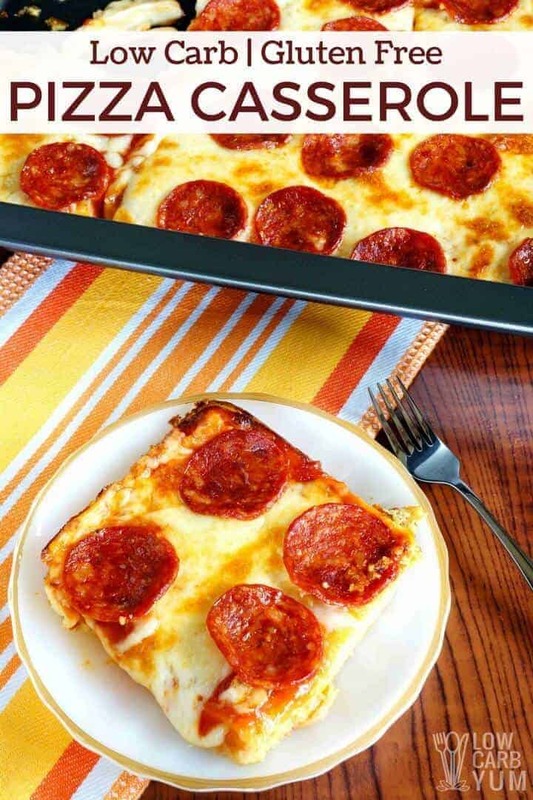 I used a 9×13 casserole pan, but the recipe could easily be doubled to fit into an 18×26 jelly roll pan for a party sized sheet pizza. I’m not always successful getting my husband to eat my low carb dishes. It’s because he is very picky when it comes to food. My husband was a little hesitant to try this low carb pizza casserole because he knew it didn’t have a regular crust. However, he loved it when he took a bite. However, when I told him what the crust was made of he agreed to give it a try. 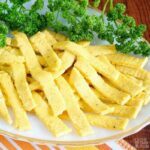 After all, he enjoys eating scrambled eggs with cheese so there was no reason for him not to like something made with the same ingredients. After taking a bite, my husband actually told me it was one of the best low carb dishes I have ever made. That’s when I knew the recipe would be a success! 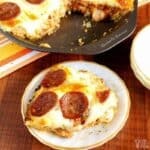 If he liked it, I know others are going to love this one keto friendly pizza. It really does taste just like a regular pizza with a soft thick crust. 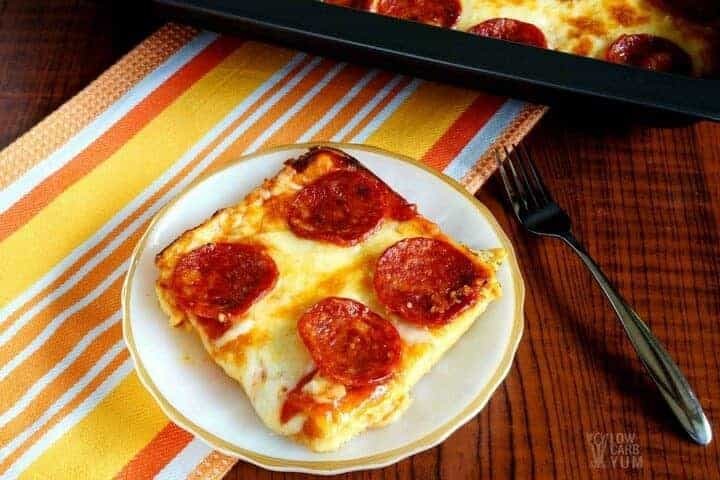 And, there are no special ingredients needed to make the delicious low carb pizza casserole. We actually enjoyed this pizza so much that I made another one two days later with some vegetables added on top. I’m also planning to make this casserole in a larger sheet pan size for my daughter’s birthday party. That way, I’ll have a low carb choice in addition to regular pizzas. I’m sure that once others give the thick crust pizza a try, they may not even bother with the high carb ones anymore. And, it’s sure to win over those who are gluten free. 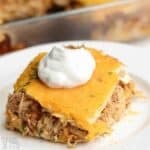 Some have even told me that they love this low carb pizza casserole better than the popular Fat Head one. I love that there’s no need to roll out a dough with this recipe. And, it’s made with regular everyday ingredients. So you won’t have to worry about buying any expensive low carb flour. However, if you have an egg sensitivity, you’ll definitely want to find another recipe for my egg-free Fat Head dough. The pizza crust used in this recipe is really just a high cheese omelette. But, with the sauce and toppings added, no one has been able to tell it’s an egg based crust. 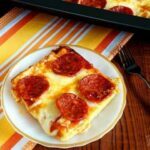 Although the other low carb pizza recipes are also great, I always go back to this low carb pizza casserole. Why? Because it’s the easiest to make. Just give the recipe a try and see for yourself. My sister shared the recipe with her friends on Facebook and it went viral within her community. You can also change up the flavor by using different cheese and toppings. You will want to keep the mozzarella and it gives the crust a good texture. I’ve also changed up the sauce and turned this basic recipe into a gourmet low carb white pizza topped with spinach, bacon, blue cheese, and sliced tomatoes. There’s really endless ways to customize the recipe. Enjoy this easy and delicious pizza! The whole family loves this one, even those NOT watching carbs. If you give it a try, be sure to let me know what you think in the comment section below! Preheat oven to 350°Grease 13x9 inch baking pan. 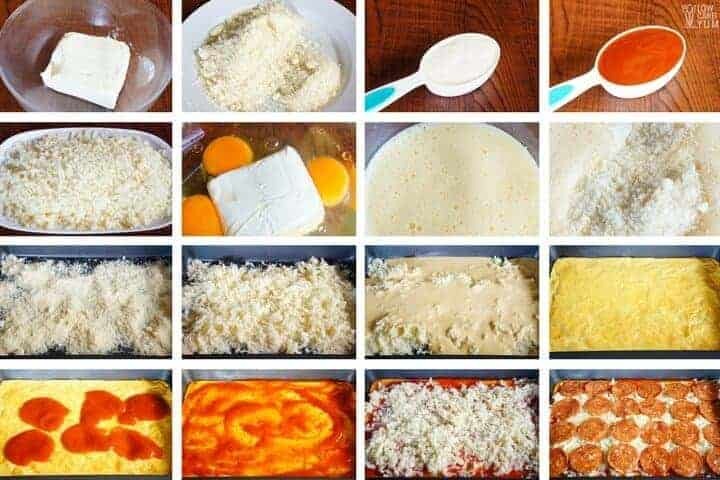 Sprinkle the Asiago (Parmesan or Romano cheese and 1 cup of the mozzarella cheese in the bottom of the greased baking pan. Pour egg mixture over the cheese. Bake for 30 minutes then remove from oven. Spread with the pizza sauce. Add pizza toppings over top if desired. Cover with remaining 1 cup mozzarella. Using oven broiler on high, broil a few inches from the heat elements until top is brown and bubbly. Let sit for a few minutes before cutting. Yummy. This is a new weekly dinner at our house. I added my toppings on top of the cheese so the meats would be crisp. Cannot believe how great this tasted. The temperature does not change from F to C when I choose “metric” Why not? It’s only ingredient measurements that change. You’ll have to convert using an online calculator to change °F to °C. I tried this recipe and actually love it. The only problem I have is that you can kind of taste the eggs. Overall, this is a great recipe. I added a little too much sauce and I put the pepperoni on the pizza before the last cup of cheese. Notes taken for my next one. I just made this and it was wonderful!!!! I cooked up some Italian sausage then added pepperoni and mushrooms for the topping portion. It was so so good! This recipe is so delicious! It’s our new favourite pizza replacement. I use 2 cups of mozzarella in the crust instead of 1 cup and 1 cup of the other cheese, as I like the crust to be fairly neutral vehicle for the toppings, and mozzarella has a less powerful flavour. Tonight’s creation is home made sauce, roasted garlic, asparagus, sauteed mushrooms, salami with prosciutto and triple cream brie – yum!! Great recipe!! I would fix it even if I weren’t eating low carb. Loved it! This dish was really good. Totally satisfied our pizza craving. I will be making this again! Yum! Sounds like a perfect Meat Lover’s pizza! I have nothing new to add, jsut … This is to die for! It tastes just like the pizza I order out. Whenever I make a recipe that “tastes just like the original” (which I notice you are careful not to say) I try to grade it on its own merits, not those of the original recipe. This pizza, however, stacks up to Italian pizzeria pizza. The leftovers even taste exactly like leftover pizza. I really like the thickness of the “crust”, I bet it can handle a stack of add-ons. I do miss that crisp “crunch” of a regular crust, however the flavor is right and that’s more important. This is the third or fourth recipe we’ve tried from this site and we’ve loved every one of them. Moving on to the Asian section for a few nights. Yum! Thanks so much for writing in Hilary! I relied on this recipe a lot when I first started my low carb journey to curb those pizza cravings. After making the base, I realized I was out of tomato sauce. Converted it to mexican with salsa, sour cream, and avocado. Incredible! This is so delish! My hubby and grandkids love it. Its a Winner! Starting a keto diet plan, so I made this for dinner tonight. It was awesome! I also like eggs and cheese, so it was a winner. Added onions and turkey pepperoni to mine. Easy to make, and I will defiantly prepare this again. 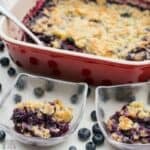 This one is really popular for those just getting started, but it’s also a favorite for those of us who have been low carbing for years. I’m intrigued. I read another recipe just today that wasn’t keto (the flour would be replaced with almond flour to make it legal) and they loaded the toppings in with the pancake like batter. It makes me wonder if u can do the same with this. When it’s done u can cover with sauce and cheese and probably reduce the cooking time to save the “crust” from getting too over cooked. I make that observation because I’m the “kitchen sink” kind of person when I comes to my pizza. 😂 if I cooked the crust first, by the time all of my toppings were heated, the base might be rubber! The crust on this pizza is basically a high cheese omelette, but I don’t find it eggy at all. It does need to be cooked first so the topping won’t sink into the crust. My family loved this recipe. 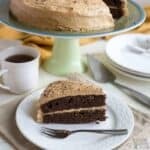 Could I use milk instead of heavy cream? It’s worth a try but I can’t guarantee the results. But since it’s similar to an omelette, it should work out okay. Yay! It always feels good to enjoy those high carb favorites in low carb versions. This was delicious! Even my extremely picky boyfriend liked it. But it was still not even for my big family and they wanted more. Is it possible to double the amount to make it thickee? Would I have to cook it longer or would i just have to make two batches? If you take a look at my white pizza recipe it’s basically the same crust mixture poured into a sheet pan to make a larger sheet pizza. And I do like the thinner crust too. Otherwise, you can just double the recipe and bake it in a rimmed sheet pan instead to get a double size pizza. Made this tonight & it was so delicious! I don’t care for the cauliflower crust so I tried this recipe, never thinking it would be so good. My husband also loved it. We like a lot of garlic so I added 3 fresh minced garlic cloves instead of 1/2 teaspoon. The toppings I used were sauted onions , red peppers & pepperoni. I was wondering how far in advance can you prepare & bake the crust? It would be so easy if you could make ahead of time. Wasn’t sure so made it like the recipe said. If anyone knows please let me know. This is definitely a keeper & will be making it whenever we get the urge for pizza which is quite often. The crust can be made ahead and stored in the refrigerator for a few days or the freezer for longer storage. You may want to undercook it a bit since it will need to be reheated. Tried this recipe and I have to say, it, was great. Even my kids enjoyed it. Recommend to anyone. Whole family really enjoyed this! So easy to make, too. Great recipe but 5 minutes prep time? On what type of clock? Mixing and pouring the crust then topping off the crust shouldn’t take more than 5 minutes. However, some ovens can take longer than 5 minutes to preheat so I’ll change it to 10 minutes. Delish! I found the crust a bit eggy in texture….could I add a small amount of coconut flour to make it a little more bready? You could try adding in some low carb flour and making it more of a Fathead type crust. My husband made this at my request for my birthday. Hands down best gluten-free pizza I’ve ever had. I just went keto and this was the perfect way to celebrate without too many carbs! Thanks! Could I make mini cupcake sized versions of this? If so, how long should I cook it? That should work out. You’ll just need to cook the crust part in each mold until it’s browned. I don’t have a good feel for time as I haven’t tested so just keep an eye on them. Then, add toppings and put under the broiler until the cheese is melted and lightly browned. Just made this tonight and it was a hit! Yes, the crust doesn’t taste like pizza but that’s because it isn’t! It’s a casserole. I used fresh shredded parm and the crust tasted like cheese. It has an eggy texture but with the sauce and toppings it isn’t eggy at all! This was delicious! We added green peppers, pepperoni, and meatballs. I wanted to make sure the meatballs were heated through so I put it in at 350 for another 10-15 minutes. Worked great! Will definitely make again! Meatballs sound like a great topping! Are you kidding me? You are a culinary genius!!! I’ve been making gluten-free pizzas for many years, but decided to go keto and needed a low-carb recipe. The macros on some are way off. The other seem to require almond flour (an allergen for me). You nailed this! The flavor is better than I could have ever imagined. I’ll take this any day over any other pizza I’ve ever had… even the high-carb, glutenous pizza. Thank you so much for sharing this masterpiece with us! I’m so glad you stumbled up this one. It’s been a regular for me and my family since I first started on low carb. Hi! Does the “crust” have a quiche like taste and texture? My family doesn’t think so. It’s more like a soft crust pizza. If you prefer, you can half the crust ingredients for a thinner crust. This was amazing. My husband and I are keto and this was amazing. We only have one slice left! Thank you for this perfect recipe. Sounds like it was a hit! My picky eaters love it too. Made this for dinner tonight. It did not disappoint. Cooked the crust 40 minutes could have done 35. Will absolutely be making this again switching up toppings. You’re welcome Tawna. Glad you enjoyed the recipe. I have made this twice as pizza but decided to try it as bread for a tomato sandwich….awesome!!! Wow! I have to give it a try. Do you think this would be an ok recipe to freeze and bake later? My celiac sister has a new baby and I’m trying to make her some amazing and easy meals she can just put in the oven from the freezer. You’d have to at least bake the “crust” part then freeze with sauce and toppings. Your sister would just need to reheat in the oven and brown up the top. I have a question. I want to make this for a party I’m throwing tomorrow. But the video shows using slices of mozzarella yet I haven’t heard any mention of that.. So do I use slices of mozzarella on top of the crust or shredded on top of the crust? Better yet,,Are there any slices of mozzarella in this or all shredded mozzarella? Thank you in advance for clearing this up! You can use any mozzarella… sliced or shredded. So delicious! I was craving pizza and this really hit the spot! Truly perfect! Thanks so much for the recipe! I have been on keto for 4 weeks and really needed a good slice! My husband and very very very picky daughter both LOVED it! Yay! Happy to hear it was a winner with the whole family! I’m not particularly on a Keto diet but not being able to eat any grains has kind of pushed me in that direction. This recipe is a godsend. I haven’t eaten pizza this good for years. I can’t wait to make it for my husband as he often wants pizza but tries to wait until he is away for work to eat it so it isn’t in front of me. Sometimes I have something like this or eggplant parmesan that I make for myself so that he can have his take out pizza! Thank you so much for this. I made my own sauce (because of the intolerances) and I also sauteed fresh fennel until it was very soft and added that in a layer just before the sauce. Delish! Thank you, thank you. I’m so glad you found an easy pizza recipe to enjoy any time! I looked everywhere at my grocery store for heavy cream and only have heavy whipped cream. Will this still work? Yes. Heavy and whipped cream are very close, only the fat content differs a bit. I rarely leave comments on recipes but this is such a hit with my family! We love it. I’m so happy the recipe worked out for you and your family! Has anyone added nutritional yeast season ? Thoughts on using it? This recipe looks amazing! I’ve only been keto 5 weeks and pizza is a favorite of mine. Can’t wait to try it. I haven’t, but I know others like the taste it gives. If you watch the full video, it’s stated that an electric mixer can be used instead of a food processor. Wow! Just wow! Make this! You will not be disappointed. Great job Lisa! I made two batches first go around with 2 different 9×13 dishes. I made the base all together then split the amount in half for each dish. Reading what some comments put about how the base could be eggy, I made sure the base was nice and brown (not burnt) before taking it out of the oven. Yo Mama’s Marinara. 6 net carbs for the whole pizza or 0.75g net carb per slice if cut in 8 pieces. On the kids pizza I just added pepperoni and bacon crumbles. On the adults pizza I added pepperoni, italian sausage, sauteed red peppers, bacon crumbles. I also added a bit more mozzarella to the top of each again after putting the toppings on to melt a bit. A word of caution for the broiler. I haven’t use mine much but be sure to keep an eye on it. I walked a way for a bit and when I came back the tops of the toppings were charred just a bit. I got there just in time. It only takes a couple minutes at that setting to finish it off. Yes! You do need to keep an eye on the broiler as it can burn quickly. I’m so glad you all enjoyed the pizza! I’m so glad it helped you stay on track. 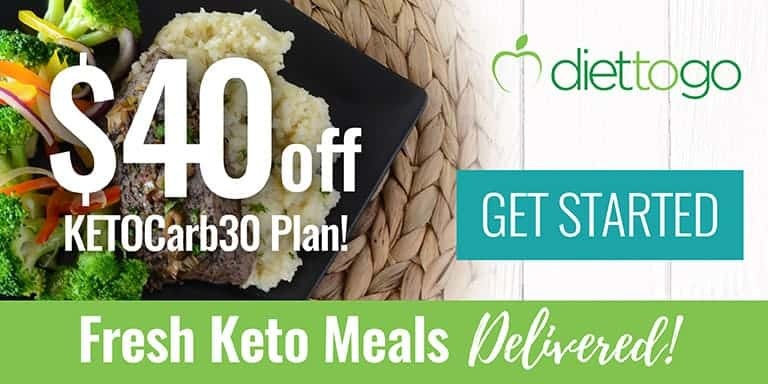 Wishing you much success with keto! If you grind up a few tablespoons of Chia seeds and add them to the crust, you get a bunch of fiber, and a few net carbs. But the crust is much more bread like. I far prefer it that way now. It also makes the bottom a little less greasy. This was so good and a hit for my whole family I will make again soon!!! Are the macros without the toppings? It includes the cheese topping, but no add-ons. Are the 2 cups of mozzarella to be divided? I didn’t see that and I put two cups of mozzarella into the crust and didn’t even think about the mozzarella on the top. Plus, would it be ok to use the shredded mozzarella . Yes. 1 cup for the crust and 1 cup for topping as stated in the instructions. I noted in the ingredient list that it should be divided. Sorry about not stating it up front. This was absolutely delicious! I do have a question though. My crust was kind of soft and floppy, is that how it’s supposed to be or should it be hard? It shouldn’t be soft and floppy it should be firm-ish. This turned out amazing. Just started a Keto diet and I LOVE pizza. You can hardly tell the difference! Thank you for this recipe! My family and I are new to Keto, this seriously takes care of a pizza craving. My husband couldn’t believe the ‘crust’! Simply delicious! I let it get golden brown as you said to do, and it was perfect, not egg’y at all, as was posted in some comments. This was soooooo good! My husband really liked it. It was so easy to make. I used Italian sausage and turkey pepperoni for my toppings. This will be a go-to for me for sure. I’ve been on Keto for 8 weeks and I crave pizza daily. I now can satisfy my craving. This is the BEST food I have eaten in 8 weeks. I added more meat and other no carb pizza toppings which made it look like a deep dish! Absolutely awesome. My husband who hates my diet took it for lunch to work a couple of days. Thank you!!!! Love that your husband enjoyed it too! OMG I have made this twice in a week. I even had this while my son was eating a cheese pizza I ordered him. Flour crust is merely a cheese delivery system so a crust made of cheese is just the best of the bestest!!!! I agree! My family loves this pizza and they are not low carb. I’ve been keto for about 4 months now and have come across a couple of keto pizza recipes that were “okay” but this one is the best by far. This is even after messing up by accidentally adding 2 cups of mozzarella to the “crust” instead of one cup. My non-keto hubby and daughter, who support me by eating what I make, think so as well! I topped it with sauce, sauteed onion and bell pepper with mushrooms, pepperoni, and fresh mozzarella. I am already looking forward to lunch tomorrow. Thinking about doubling the recipe next time so that I can have even more leftovers as I foresee my hubby helping himself to “MY” pizza….LOL! Thank you so much for this recipe!!! My husband is diagnosed diabetic with Celiac, and has Gastroparesis, so I was excited to find this recipe because he loves pizza. However, we have to watch the fat intake due to the Gastroparesis. The recipe calls for the mozzarella to be full fat. I’m assuming there is a good reason. What would it be like if I used a non-fat or low fat mozzarella? Thanks! The 2% actually works better than full fat so the lower fat or non-fat should be okay. This is an absolutely fantastic recipe. I have made this several times at home for my family. I’ve had fantastic results on the ketogenic diet! 40 lbs down in 3 month. Many people are having great success and with this information, I hope you do too! Pizza was really good and I used the turkey pepperoni. It’s one my family’s favorites too! Would I be able to prepare and bake the base of the pizza the day before? Did you try this method? Wondering sane thing and what the results were? I want to do the same. Did you try this method and how did it turn out for you? Thanks! AWESOME! Made tonight for my diabetic husband and me! We both loved it. So easy to make. Followed directions pretty much to the letter except for the Asiago cheese. Didn’t have that. Just used more shredded parm! Also added green peppers and pepperoni and cut in smaller slices. Can’t wait for breakfast tomorrow to try cold!!! This is the second year that we are using this recipe for Fridays during Lent. It is the best tasting keto pizza recipe that I have tried. 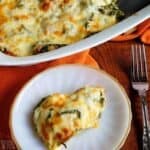 It is a great recipe for Lenten Fridays! Delicious! This recipe did not disappoint! This was superb! Absolutely cured my pizza craving. My non-keto eating husband even gave it high praise. I will definitely make this again. This was not good. I love pizza and this was not pizza. It ended up being pizza toppings on a weird soggy scrambled egg-like thing. The top of the ‘crust’ was browned, I followed the recipe and it just wasn’t good. 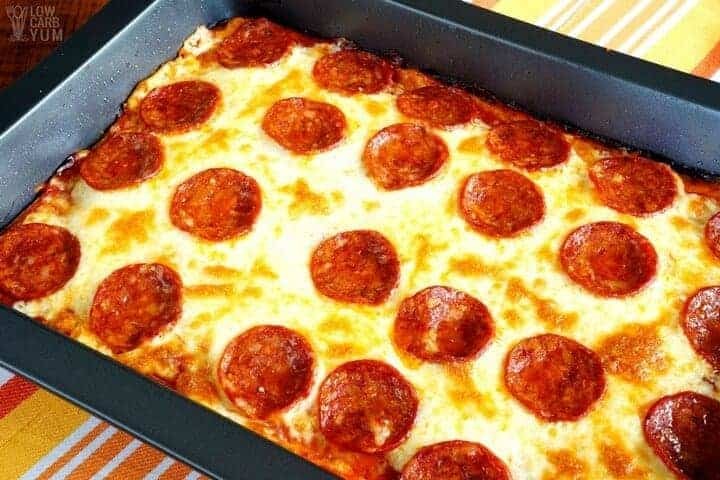 It’s a pizza casserole, not a pizza. OMG, I had to print it because this will be a new go-to recipe. The hubby loves it and so do I. The only thing I’m going to do different is make two so he doesn’t eat it all!!! My kids actually eat it on me so I now make a thinner crust using a larger rimmed baking sheet. This recipe is our go-to for pizza. But tonight I decided to make the crust and use it as lasagna noodles. Omg so good!! What a great idea. Thanks for sharing that the crust works as a lasagna noodle layer too! Oh my gosh, this was absolutely delicious! We will be making this again and again! We’re new to Keto and this helped us with our pepperoni pizza cravings! I just made this for lunch, and it really is good! I did the sheet pan version, which only took about 20 minutes to cook the crust. I forgot to add the mozzarella to the crust (so just the egg mix and parm), but it still turned out ok. Just a little bit eggy, but if I made it correctly, that would likely be corrected. As a personal preference, I might also add more sauce next time, since I like it thick, but the amount called for was enough to cover the crust. You will need to double the amount if baking in a bigger sheet pan. Thanks for this recipe. It was a big hit with my family too. I used the powdery cheese in the plastic dispenser and wondered if it would be ok or if I should use the grated. It worked fine. I used already grated mozzarella cheese. The only thing I changed was to add thin sliced and chopped (about 1/2 inch) bell pepper and onion. It was great! I’ve used both the powder Parmesan and the grated. Both work out for me. I have made this 2 times and absolutely love it. So yummy. I store leftover slices and eat it for breakfast. Just as good as the real thing! Let me just say…WOW! I made this tonight and it was fabulous!!!! I cooked my “crust” for a couple extra minutes just to make sure it got done(all ovens vary). Topped with green pepper, diced ham, and pepperoni. Broiled for 3 minutes. My boyfriend raved over it! Thank you so much for sharing this!!! I just tried this – followed the instructions and everything. Maybe I should have baked it longer or something. Mine did not firm up and I don’t know if there was too much cheese or what but when I ate it – it did not taste good at all. It almost made me sick and I’m not lactose intolerant. You need to check the crust before adding the sauce and toppings. It should be brown and fully cooked. Maybe your oven is off or your cheese wasn’t right? This is my “go to” recipe every week. I make one on Sunday and slice it up for the week’s lunches. I love it!! I can’t wait to play with the toppings, but so far have only used pepperoni as it is easy. This has made my transition to a Ketogenic lifestyle so much easier!! I made this in sheet pan comes out perfect! Only thing I can’t figure out is why is it salty?!?!? It’s the cheese. If you reduce some of the cheese it will reduce the sodium. Or switch to a quality block cheese that does not have any anti caking ingredients in it, those tend to be saltier as well. True. Those can be hard to find in regular markets, though. I’m obsessed with this pizza! I started Keto three weeks ago, and pizza was the food I was the most sad about giving up. Thank goodness I found this recipe. I make it in a large cookie sheet and it tastes like legit thin crust pizzeria pizza! My husband says he tastes the egg, but I don’t at all. Love it, love it, love it! New to low carb-was excited to share pizza night with the family ( we’re used to Dominos)so first bites were exciting and tasting like pizza. I had to keep getting over the idea of “egg” though it didn’t taste like egg. By the end of the only piece, I have to say it was beginning to roll around in my mouth picking up different flavors and not going down as easily. I didn’t use fresh grated parmesan and think that might make a difference. I haven’t tried fathead yet, so will give that a whirl. Our family is switching to a Keto diet. We just had this tonight. Everyone loved it.!!! So easy and very tasty. I think putting some ham and cheese on this crust would make a very good breakfast pizza as well. Thank you for this receipe. Hi, I just noticed the video says to bake for the final step, but the written recipe says broil. What is correct? Thanks, and I am really enjoying this site so far! I broil to brown the cheese. I updated the nutrition using the latest calculator I have. The calorie count did move up. I made this tonight and was surprised at how good it was! I used a 9 by 13 cake pan and the crust did not get firm enough To pick up but it was still delicious. Next time I will try a larger pan to see if it will crisp up with a thinner crust. I made a double batch of the crust batter so I may be trying it very soon! I’ve always used parchment paper when making dough before. Is that needed or not? You shouldn’t need it if you grease the pan. Trying this now and of course, as I anticipated, dough comes out of oven looking nothing like video, more eggy like a omelette/casserole than pizza, yuck! Did you cook it until browned? It is an egg based crust so it should look similar to an omelette. Very easy and satisfying! Loved this and will definitely make it again many times. My granddaughter is 8 and was diagnosed with celiac disease when she was 3. Pizza is a hard thing to find tasty and gluten free. I am very excited to make this for her. Do leftovers heat up well and how would you suggest doing it? Yes! We reheat the leftovers in the microwave or toaster oven. Tastes as good as fresh! The broiler is the best way to brown the cheese. You could just put it back in the melt or brown as best you can in the oven. Just tried this tonight…only modification I made was a 1/4 cup more Parmesan in the crust. We made it in a sheet pan and made a Margherita pizza with fresh mozzarella, five cheese blend fresh basil and sliced tomatoes. Oh. My. Goodness. My husband who so far has only tolerated the Keto recipes I’ve made so far absolutely loved this and so did I. Couldn’t taste a difference and maybe the thin crust made a difference because there was no “eggy” texture to our crust. So happy I found this because pizza was the biggest culprit to me having to be on Keto, and with this replacement, I’m in heaven! This is so good!! I’m so surprised and can’t wait for our next pizza! The parmesan that goes in blender is that shredded or shaker kind. I think I’m confused on the cheeses. You can use either, but I prefer shredded. I made this to bring to a pizza party. It was delicious! My son’s fiancee who is GF, but not keto, said it was the most delicious thing ever! She is a pizza fiend! I topped with Italian beef, green peppers, onions and mushrooms on one half. Even the non-keto people (who had their own, glutenous pizzas) thought it was yummy. I can’t wait to make it again! Thanks! 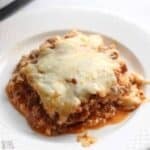 I’ve served this at parties and it’s always a hit even for those not on low carb. Love the sound of those toppings! I made this tonight and I have to say FIVE STARS! I just started the keto diet and its hard to find taste bread type of foods. This recipe is the first one I tried that was actually very good. Flavorful and taste just like a pizza. The changes I made were, italian seasoning for the oregano and I added 1/2 tsp of Red Pepper Flakes. Thanks for sharing how it worked out for you! This was awesome! Really love how easy it is. Making it again for lunch at work this week. Thanks soooo much! I also love the other ideas on using this for lasagna, I will have to try that as well. Glad you loved this one as much as we do! Great store bought marinara sauce is Rao’s. Its pricy but fabulous and only has 3 net carbs per half cup (no sugar in it). Can’t wait to try this pizza. I always need a quick go-to for a busy night and this looks like a winner. I missed where we are supposed to add the heavy cream, I am assuming it’s in the egg mixture? It’s in step #2 of the instructions. This was fantastic! My husband was raving about how delicious this was and my kids begged for more. I’m the only one eating low carb and I was hoping to have lots to take as leftovers for my work lunches. Not so much – the whole family gobbled it up! That’s why I make the casserole in a larger jelly-roll pan now. It makes a thinner crust and more slices. My husband is currently on a keto diet (low carb) and I’m gluten free. Last night I got to make a meal for both of us and my kids and it was a hit! This is a recipe that will be sticking around in our house! Awesome! You know it’s definitely a hit when the kids eat it up. I am ecstatic to try this recipe this weekend! We usually have fathead and I’ve been loving it, but it doesn’t quite last as long for two of us – when it’s just me, I eat it for lunch the next two days, but when my husband eats it too, it’s gone in a flash. So I think this recipe might do the trick. Fill him up and still leave me with leftovers the next day. If you want to extend this recipe even more, I recommend making it in a larger jelly-roll baking pan. It will be a thinner crust and be almost twice the size of one done in a 9×13 pan. I made this for dinner Friday night and used a round pizza pan for it. I was skeptical of it coming out like pizza, mainly because of the lack o f an actual crust and I was very happy with the results. The “crust” really did provide the perfect platform and delivery system for the toppings that we put on it and even with the toppings we used — feta, mozzarella, spinach, pepperoni, mushrooms and roasted peppers — the calories for one piece were still low as was the carb content. I think this is going to be my go-to recipe for when we’re craving pizza. Yay! Happy you enjoyed it! I have made this several times and it is wonderful! My husband is a diabetic and loves pizza. He absolutely loves this recipe. Thank you! You’re welcome! Thanks for writing in to let use know how much you and your husband enjoy the recipe. Four enthusiastic forks up at our house. I forgot the heavy cream and this still rocked! Good to know it’s still great without the cream! has anyone tried this with coconut/almond milk to replace the heavy cream? would it still work?? I haven’t, but I’m thinking it should work. Do you think I could half the recipe for it to be made in an 8×8 pan? 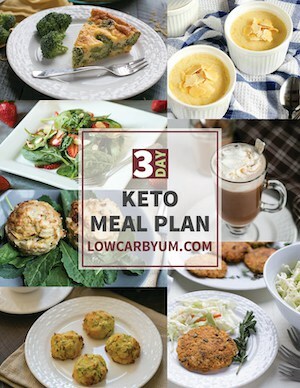 It’s just me eating Keto and I won’t be able to eat the whole 9×13 recipe! You can do that or freeze half for later. Can you freeze it once you have cooked it? Thanks for this awesome recipe. I made this last night and liked it a lot. However, mine is too eggy. Did I do something wrong? or is there anything I can do to make this less eggy? You can make a thinner crust by halfing the crust ingredients. Or, you can try using all egg whites. I have been looking at this recipe and thinking that it could work in a slow-cooker. If you have a crock that can go in the oven for browning the top, I’d say yes. The crust can definitely be cooked in a slow cooker, but it’s difficult to brown the top unless you put it in the oven. Also, I doubt the bottom of the crust would cook as well in the slow cooker. Wow! This was a REAL hit with the entire family. 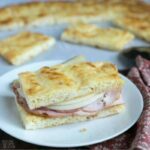 Hubbie is always looking for low carb options and he absolutely LOVED this recipe. One tip to share. Don’t buy sugar free pizza sauce. I used America’s Test Kitchen pizza sauce recipe which is crushed tomatoes, garlic and olive oil. Worked great and didn’t add a bit of sugar! I’ll have to look for that brand of pizza sauce. Sounds great! It’s a recipe, not store bought. Oh. I’ll look that one up then! Renee — Any chance you could share the recipe you used? The site you reference charges a membership fee. Where could I find this sauce please? 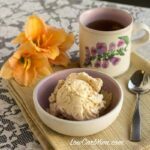 You can make your own using this recipe or buy pre-made at the store (just look for one without sugar). Walmart’s brand Great Value is the only pizza sauce I can find store bought that has zero sugar is only 3 net g of carbs. It’s also like $1.12 I believe! Win win!! I cant tell you how much I love love this pizza. I used the thinner version and made a Margarita Pizza with fresh tomatoes, fresh mozzarella, fresh basil and good dried oregano. I use to eat Margarita Pizza all the time and I missed it. NOT anymore!! Just incredible. See my pics on your Facebook page! I saw your photo Allison. It looks so good that I bought some fresh mozzarella to use with our garden tomatoes to make a Margherita Pizza this weekend. And, I’ve been doing the thinner crust too in a larger rimmed baking pan. Oh man, this was pretty good, but I think I found an amazing use for this “crust”. I made this Friday night, but I used a sheet pan for the dough instead of a casserole dish because I wanted it thinner. Well, I had a few pieces leftover so I layered them, topped them with sauce, and heated it. It was reminiscent of lasagna, and delicious!!!! I am definitely going to be using this “crust” as my lasagna noodle next time for individual lasagnas. Interesting! I’ll have to give that a try! I’ve been searching for a good lasagna noodle. love this recipe! it was so easy to mix (I used my blender) and it smelled great cooking. Thanks! Glad it worked out in the blender. OMG! I made this tonight! Delish! Very tasty. I used shredded 3 cheese blend instead of the grated asiago, etc. Worked just fine. I also used a lb of italian sausage as a topping. Upped the calorie count quite a bit though. I really wanted more than one piece but didn’t! Next time I will go for more veggies as a topping. thanks! I made this tonight for dinner… WOW! I couldn’t get over how delicious this was, and my family couldn’t believe that it had no flour or bread in the recipe anywhere! This dish is definitely a winner and will be a staple in my home! Thanks Lisa! You’re welcome Alli! So glad the family enjoyed it! I thought whole milk wasn’t allowed on low carb? Whole milk mozzarella cheese is not the same as whole milk. It’s lower in carbs than the low fat cheese. Ok, you totally saved from cheating on my LCHF diet! This is so good. Even my boyfriend liked it and said it was better than any store bought pizza! He doesn’t do LCHF but still loved it. Thank you so much. My pleasure! Glad that it was a hit. This was perfect pizza at its best! It will be on the weekly rotation. Imagine, low carb pizza GUILT FREE! Thank you! Can this be made ahead and frozen or refrigerated overnight for baking the next day? This casserole uses an egg based crust similar to quiche. You could prepare the crust part ahead and bake with toppings later from freezer or fridge. If freezing, I’d add the sauce and topping before freezing. I’d probably hold off on the sauce if putting in fridge so the crust won’t get soggy. Which sugar-free pizza sauce are you using? I haven’t been able to locate a truly low-carb tomato/pizza sauce. Cannot wait to try this! I don’t have a specific brand and sometimes just make it using tomato sauce. I typically just buy the one with the lowest carb count making sure no sugar is added. Nature’s Promise has a good, organic pizza sauce that is truly sugar free. 1/4c has 2 net carbs. Thanks! I’ll have to look out for that one! Walmart’s brand Great Value is the only store bought pizza sauce I can find with zero sugar and 3 g net carbs. I believe it only costs $1.12 too! Win win! This sounds recipe divine but I have a question … does the cream cheese have to be full fat and can you use anything besides heavy cream? Thank you for the wonderful recipes! Blogs like this make it easier to be carb free!! You should always use full fat when on a low carb diet so that’s the cream cheese I typically use, but a lower fat one will work in this recipe. You could use a low carb milk in place of the heavy cream if you’d like. The crust is egg based so it’s somewhat like an omelette, but doesn’t really taste like one because of the cheese and sauce. Thank you for the very speedy reply! I am so anxious to try this soon!! This was really good! I also used the trick of using the immersion blender to mix the cream cheese and eggs, which worked great. This will become a regular recipe in my low carb world but still tastes like a yummy pizza from my old high carb world. Thanks fora great recipe! I always forget about the immersion blender. It is easier than pulling out the big food processor and I love how you can blend things in the container. Glad you liked it! I realize this is probably a silly question, but for the mozzarella and Asiago/Parmesan or Romano, the cup counts are for *grated cheese*? This recipe seems so very, very simple … so, of course my mind goes to ways to complicate my life (like sautéing zucchini & onions, for a topping). Yes. Measurements are for grated cheese. This is a recipe I often turn to on busy nights. Asiago is my favorite. individuals? 😛 And, if you are posting on additional online sites, I would like to follow everything fresh you have to post. Amy, I would love to see that slice of pizza. I’ll admit that when I make this, I always eat a cold slice the next morning for breakfast. Thanks for taking the time to share your results baking on parchment paper. I have had great results baking other pizza on parchment paper, but never thought of doing it with this recipe. This was delicious! Toppings I used were sausage, pepperoni, salami, onions, bell pepper and olives. While it’s definitely a casserole and meant to be eaten with a fork it had a flavor that was reminiscent of the deep dish pizza from Mazzios that I love. I really miss pizza and have tried many low carb options. I had settled on a recipe that has a cheese based crust you roll out and can actually pick up the slice but it’s pretty time consuming. This was as good, although different, and far easier! A keeper! Those toppings sound delish. Thanks for sharing your results on the recipe! Made this last night & it was a big hit with my family. Next time I’ll skip the pizza sauce & use olive oil, pesto because I don’t like red sauce. Also, I used an immersion blender for eggs & cheese blending worked better. A simple quick recipe that I highly recommend. Your modified version sounds great Anne!